Hats are a reflection of a culture throughout the world. The hats in "Khans, Nomads and Needlework" were not the main focus of that book but the included hats were well received. Now Russ will focus on these ubiquitous textiles in this book. This book will be available at the exhibition and online before the opening. It will include about 150 rare hats, some types never before published. In addition to images of the hats there will be many images of people in the region to help the reader understand the relationship between the hat and the person, and their culture, that wore, enjoyed, designed and crafted it. "Hats" includes crowns, turbans, veils, headdresses and other objects worn on the head, plus a few accoutrements. There will also be many examples of dervish hats. The geographical scope ranges from Turkey to Xinjiang China, or from Melas Anatolia to Tashkurgan and beyond. 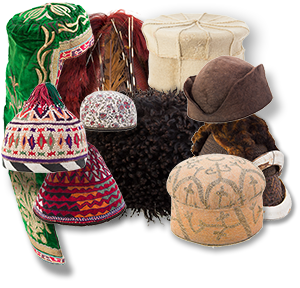 The countries/regions where the hats are from include: Turkey, Syria, Iran, Yemen, Azerbaijan, Central Asia, Russia, Mongolia, Nagaland, India, Pakistan, Tibet, Bhutan, Southeast Asia, and the Philippines. The book will discuss history, provenance and background of the cultures and cities related to the hats. The cultures represented include: Muslim, Jewish, Christian, Buddhist, Hmong, Druze, Azeri, Uighur, and Turkmen. 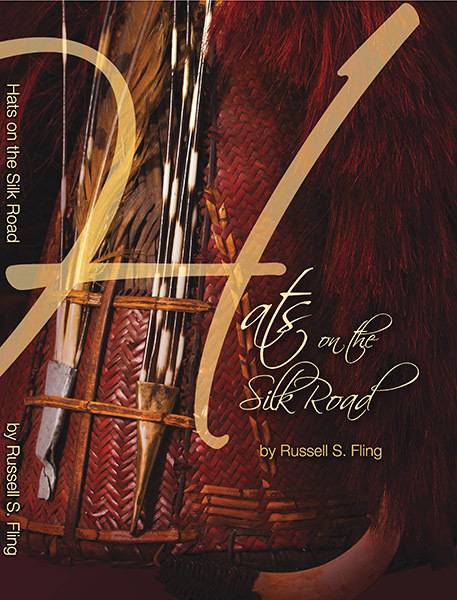 Yes, put me on a mailing list to get updates about this new book and other news on Silk Road Splendor.